Tuesday, our first day as a group, we headed off to Stirling Castle, one of Scotland’s two best known fortresses. The history tour was interesting, but most fascinating was the tapestry work going on. 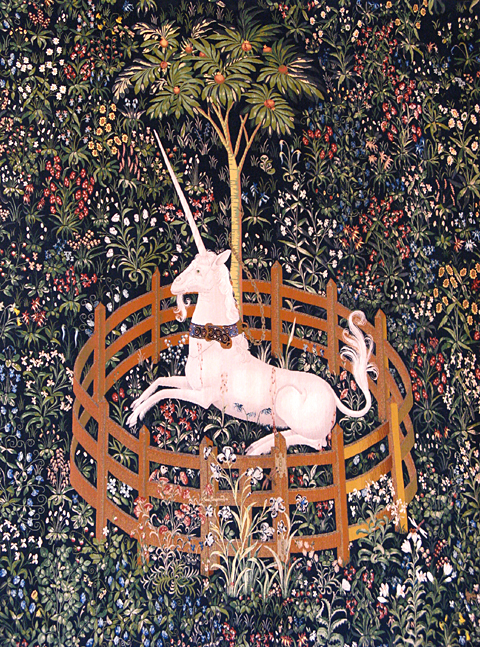 There is a set of tapestries called the Unicorn Tapestries, now housed at the Metrolopolitan Museum in New York. I’ve seen pictures of them before and they are intricate, albeit somewhat faded and dull in color. That’s the way I thought Medieval tapestries were originally. But today I learned otherwise. After our castle tour, we had a tour by Louise Martin, one of the Senior Weavers on the project. We started with a talk in front of three completed reproductions, then went to another location where another of the series is being woven. The most stunning thing about the new weavings is their color. They are bright and colorful, to say the least. The talk in the studio, where we could watch Rudy, another of the weavers, working while Louise explained the process and answered questions, was fascinating. Each tapestry uses over 100 colors of yarn, most in two different weights, and most of them wool. The warp is cotton and some cotton is used for color highlights in the weft. 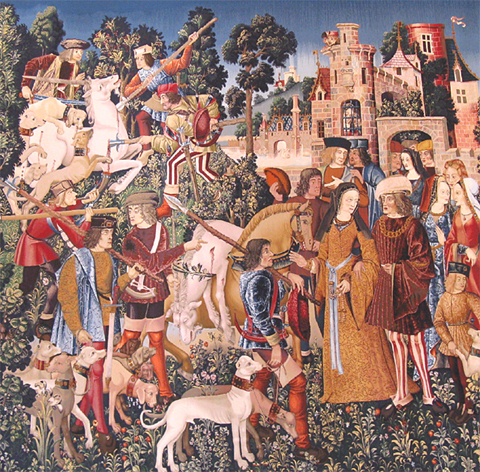 The tapestries themselves are reduced in size 10%, and there are other minor changes in weaving technique, but the end product looks like the originals, only much more vivid. Because they aren’t trying to make exact replicas (which would be impossible in any case, due to deterioration and earlier repairs on the originals) the weavers have some latitude in how they will implement the original. Such creative license must be necessary for them to maintain their sanity, working for such a long time on this big project. I believe Louise said she had been on the project for seven years and it has another five years to go. 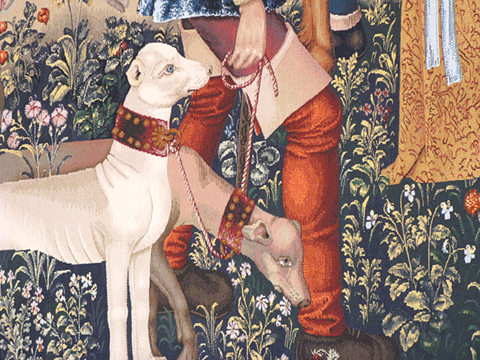 That’s a major commitment, but the tapestries they are producing are worth it. Another way to understand the time involved is that each of the four weavers on the project is expected to weave on average 7.3 cm. square each day, about nine square inches. I certainly don’t have the patience for that! Seeing such rich colors gives me a whole different impression of Medieval tapestries. Bob, I’m enjoying your Blog. The description of Stirling Castle and the link you provided brought back some memories of my travels in the “old country” as my father always referred to it. I had a fantasy of researching our family history and finding an unclaimed McCulloch Castle from a long lost relative. The we would post our Coat of Arms and stake our claim to the property…. and the best I did about that was to find a Hotel Craig in the highlands. Well it was a fun fantasy! 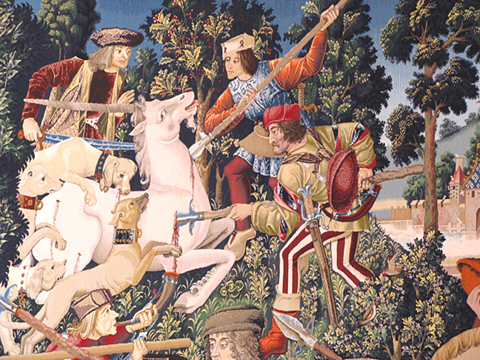 Bob–the Unicorn Tapestries are actually housed at The Cloisters in New York. It is an imitation monastery and museum built on the cliffs overlooking the Hudson River in upper Manhattan..the neighborhood I was born and lived the first few years of my life. It is a lovely place to visit–I try to go there whenever I am in New York–an oasis of peace and tranquility in a super busy city! Can we both be right? My Gospel of all things correct (Wikipedia) says they are stored at The Cloisters, which is where the Metropolitan stores its medieval collection. I suppose a true New Yorker (you) would say the Met is that other thing downtown (or wherever it is), not The Cloisters. 🙂 In any case, it sounds like a lovely place.